The Harrisburg Regional Chamber, in partnership with John Dame, is proud to present the Vistage Emerging Leader Program. This program prepares your rising stars to become your next generation of senior leadership. Under the guidance of a Vistage Chair, an accomplished business leader and master facilitator, participants develop core leadership competencies and confidence, empowering them to deliver on company goals. Unlike other leadership programs that squeeze material into a few back-to-back days and leave implementation at risk, Vistage emerging leaders focus on one topic at a time to encourage mastery. Participants will be challenged to advance their careers within your company, rather than seek outside opportunities. Develop a proven team of senior leaders equipped to take your company to the next level. We recognize the need our members have to train their employees to become stronger leaders that manage successful teams. If you’re looking to help advance your future business leaders, this is the perfect program for you. Core leadership competencies: Training in 12 leadership competencies within four key areas: personal, inter-personal, team and organizational leadership. Career advancement: The confidence and proficiency to take on a greater leadership role. Networking: Valuable opportunities to expand their sphere of influence and gain professional contacts. Bench strength: Fill mission-critical leadership roles with trusted employees. Employee retention: Incentivize top talent to seek advancement in-house through a culture of leadership development. Improved execution: Improve the competency of all levels of leadership to develop an organization that is effective, adaptable and empowered. 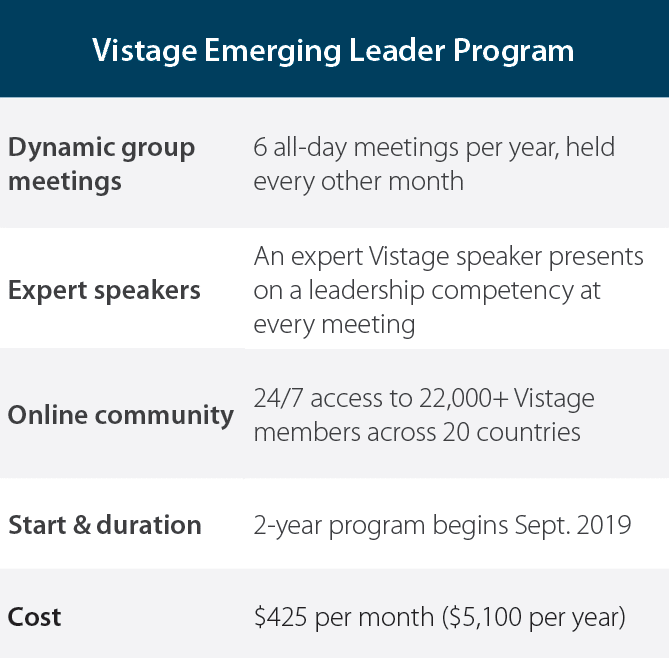 Facilitated by a Vistage Chair, group meetings are held every other month, with each meeting focusing on a single leadership competency to encourage mastery. Top-performing managers and individual contributors collaborate with peers from inside and outside their companies toward the common goal of preparing for greater leadership roles. Expert Vistage speakers lead interactive workshops on the 12 core leadership competencies. 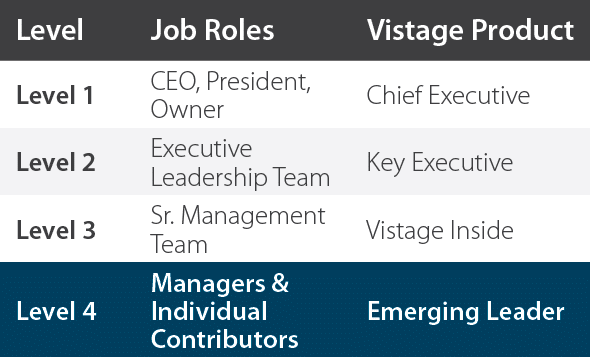 The Vistage Mentorship Framework empowers in-house senior managers to guide participants in on-the-job application of leadership competencies. Participant’s Vistage Chair and peers serve as a sounding board for new work challenges and opportunities. This two-year program includes six all-day sessions per year that will be held on the first Wednesday of every odd month starting in September 2019. All sessions will be held at the Harrisburg Regional Chamber & CREDC office. *Applications must be submitted directly to Kara Luzik Canale or John Dame. Vistage will not accept applications without prior approval from these groups. For more information about the program, contact us at any time with your questions.